Le Rosey is located on the shores of Lake Geneva, near Rolle. Among the most prestigious educational institutions in Europe, the school is alma mater to diplomats, business leaders, and royalty. The existing campus has a cohesive, traditional architecture marked by mansard roofs and a wedge-shaped campus plan that opens onto the site, defining an open-ended court. The design began with the question of how to expand the campus with a contemporary building, fostering a dialogue between tradition and modernity, while updating the arts and performance facilities for a new generation of students. The winning scheme proposes a low, stainless-steel dome that defines the site and spatially organizes the disparate parts of the program: an 800-seat concert hall, a black box theater, conference rooms, a learning center joined to a library, a teaching center, practice rooms for music and the arts, and several relaxation spaces featuring a restaurant, a cafe, a student lounge, and other amenities. A series of side openings articulates the periphery of the dome, and a terrace is cut into the center near the apex, offering views of Lake Geneva. The main interior space is the concert hall, with programmatic zones around its periphery that are articulated into an architectural promenade. 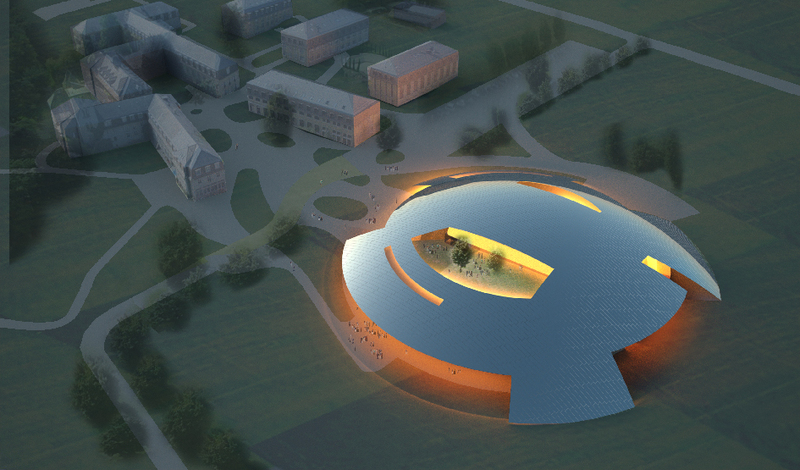 From the campus, the keystone-shaped terminus of the quadrangle forms a ceremonial entrance to the project and the slope of the dome echoes the undulating landscape near Rolle. The reflective steel will provide a distinctive identity and a landmark for the school and the region. The building’s compact shape minimizes its external surface area, acting as a thermal shield. This provision reduces energy consumption and shelters the large interior spaces under the dome with a minimum of material. The reflective polished steel offers additional energy savings over traditional cladding materials and shelters the glazed areas from sun and inclement weather.